The origins of the Bendigo Sub Branch go back to 1916. The splendid building that houses the Museums collection was completed in 1921 by public subscription, a fitting tribute to the AIF. The RSL was granted tenure of occupancy from that day.The Museums beginning dates back to 1996 and was finally opened to the public in Feb 1998. The collection at present covers from the Boer War to Iraq, medals, diaries, weapons, uniforms, personnel effects, trench art, a library and the Grinton collection "A Camera on the Somme". Such is the collection that we are now rotating items of memorabilia. The wallet is a dark green in colour. It consists of three layers of material. The outer cover and inner section are both cotton and sewn together around the edges. Where the photos sit there is a fine layer of felt that sits over the photo to protect it. The photos are Post Card style copies of the originals for display purposes. Angus Mackay enlisted on 22.4.1915 in the 7th Reinforcements 5th Battalian AIF No 2486. He later transfered to the 57th Battalian AIF. Wounded in action and while being treated in the field a shell burst overhead killing him instantly on 19.8.1916. The wallet and photos belonged to his best mate George Freeman No 2485. They joined up together both aged 18 years and went wherever the other went. 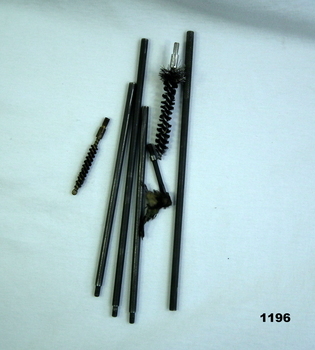 Cleaning kit for M-16 Armalite rifle. .1) 4 piece cleaning rod, 1 end unurled ( 3 of the pieces have a threaded end) .2) Wire bristle brush with two sizes. .3) Wire bristle brush for cleaning rag. Item issued to Anthony Richard Thomas No 3798215, served Vietnam with 1st Australian Reinforcement Unit (ARU) 24.12.1970 - 20.1.1970, 2 RAR 21.1.1971 - 1.6.1971. 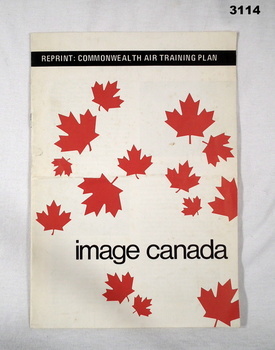 Soft cover booklet, white with red maple leaf images scattered over. Illustrated with black & white photos, 4 pages with a statistic card at end of the various air force involvement RCAF, RAF, RAAF, RNAT. 50th Anniversary of air training scheme. 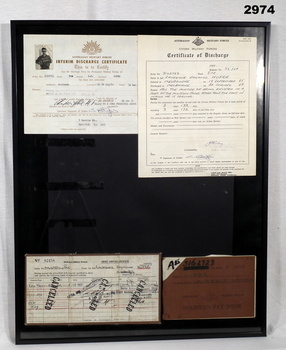 Frame, black metal, glass front, containing 4 articles relating to service of 3162723, Pte LAURENCE RAYMOND HUFER. 1. Interim Discharge Certificate. 2. Certificate of Discharge. 3. Army Driving Licence. 4. Soldiers Pay Book. 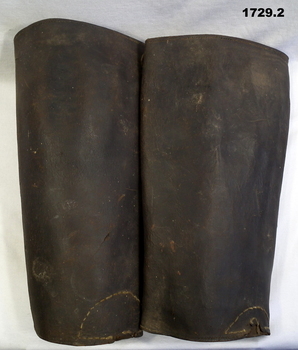 Pair of leather gaiters with metal buckle fasteners. 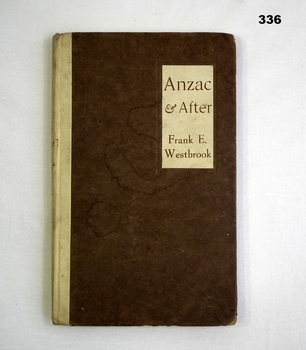 Hard, pale khaki coloured buckram cover, red print on spine, 301 cut plain pages, illustrated, maps, & black & white photos. 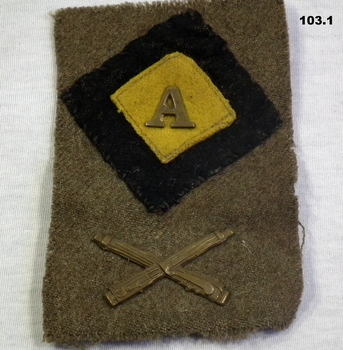 .1)Rectangular patch of uniform cloth; black diamond at top with yellow diamond inside - in centre of yellow diamond is brass-coloured 'A' for Anzac. Underneath black diamond are brass-coloured crossed machine-guns sewn onto cloth. .2) Metal badge, commemorative, 1915, depicting Simpson's donkey. Belonged to Walter Henry SMITH Regt. No 1572. Refer 102.4 medals, 104 certificate. .2) Commemorative Badge at top - "1915"; underneath "Anzac". .1) 2 Australian soldiers in fatigues with what looks like a cooking apparatus, with letters below DROW EC (stylised). 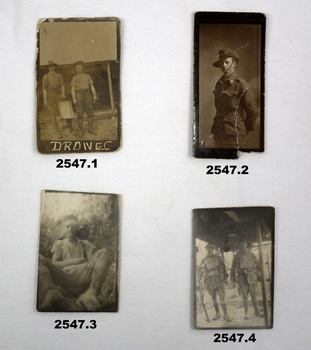 .2) 1/2 length portrait of an Australian soldier. .3) Casual portrait of a soldier sitting in fatigues, probably Sandy. Boots look muddy, scrub in background. .4) Portrait of 2 soldiers (allied) fully armed & wearing helmets. .5) Portrait of a soldier (allied) fully armed & dangerous. .6) Black & white photo of 2 graves with white crosses. 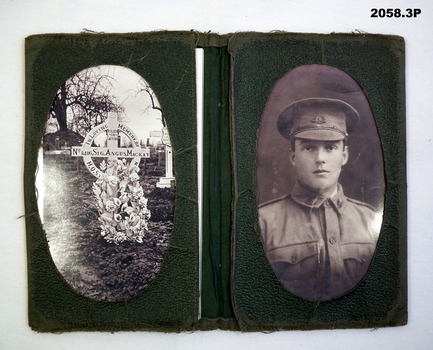 Soldiers left cross: No 912 SGT SG ISSELL 38 BN AIF, Soldier right cross: No 2802 SGT HJ FRASER 38 BN AIF. .7) Black & white photo showing 2 Australian soldiers casually dressed in the ruins of an old factory. .8) Black & white mini photo showing building ruins & what appears to be derelict boilers. .9) Black & white mini photo showing what appears to be a WWI German soldier kamerading (surrendering). This is probably posing in captured enemy clothing. 10.) Black & white mini photo showing camels at rest. .11) Black & white mini photo showing a blown up British pattern tank MK1 on sandy terrain. A track has detached & curled up over the front of the tank. Items relating to the collection re Alexander Norman Cummin No 18, 38th Batt AIF, his brother Harold Nesbit Cummin No 1239 Camel Corp. Refer 2535P (Alexander) 2530.3P (Harold) for their service details. .6) Graves photo. On the left, Sydney Graham Issell. He had 4 years pre war service in Senior cadets and Citizens Forces reaching the rank of Sgt. Enlisted on 8.2.1916 No 912 with the rank of Cpl, C Coy 38th Batt age 21 years 11 months. Embark for England 20.6.1916, promoted L/Sgt, embark for France 22.11.1916, hospital 13.5.1917 (NYD) rejoin unit 19.5.1917, WIA 29.5.1917 GSW chest then restated GSW Back, severe, rejoin unit 12.3.1918, KIA 1.8.1918. On the right, Harold James Fraser. He had 5 years pre war service in the Cadets and Citizens Forces. Enlisted on 27.10.1916 No 2802 6th reinforcements 38th Batt age 22 years. 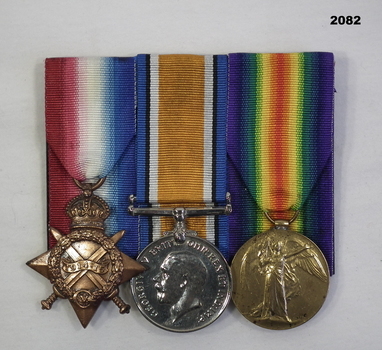 Embark for England 16.12.1916, moves through 10th, 14th Training Batt’s then 66th Batt on 28.4.1917, promoted Sgt and alloted No 2802A, embark for France 25.8.1917 as reinforcement 38th Batt, awarded the Military medal (MM)) 12.10.1917 East of Eypres, KIA 1.8.1918. Both were buried at Vaire Wood near Corbie. .1) & .2) The bayonet blade starts out parallel from the handle then flares out and then down to a point. One side of the blade is sharpened and the other has a serrated edge for most of its length. The handle is steel with a thin wood layer each side for hand grip. The wood grips have grooves cut through at an angle. 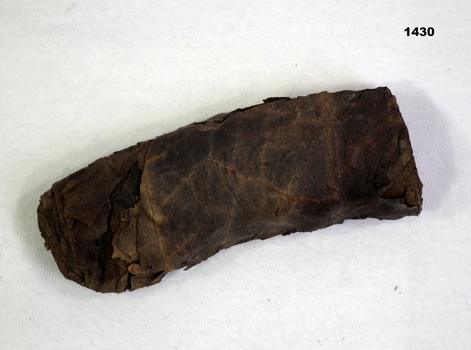 The scabbard tapers at the point end with a small round section at the point. The only other part is the standard clip to attach to a scabbard holder. This bayonet and scabbard was taken by Frederick WIGMORE MM, Regt No 1273 6th Australian Machine Gun Company AIF during the Great War. Refer 06.2 for full details re his service history. On blade near the hand guard: Deutsche Maschinenfabrik which is in a half circle, the letters A - G under that followed by the word Duisburg under the A - G. Their are no markings on the scabbard. Photograph, sepia tone, showing a large group of men in uniform sitting on tiered seats. Photograph is on a brownish coloured cardboard backing. 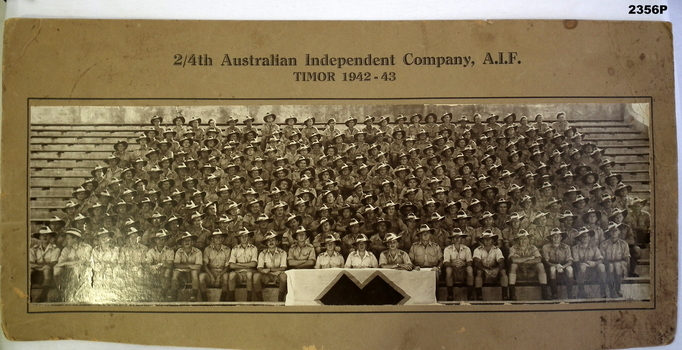 Above the photograph is 2/4th Australian Independent Company AIF Timor 1942.43. On the rear it is signed by the men. 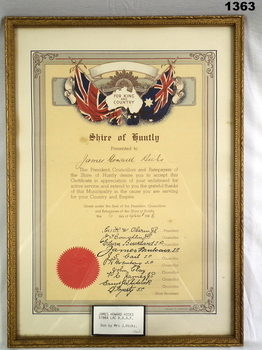 Illustrated civic certificate commemorating voluntary service with gilt wooden frame. James Howard Hicks No 51964 enlisted in the RAAF on 16.3.1942. At discharge on 30.11.1945 he was an LAC in No 2 Operational Training Unit. Identity Discs re V.H.Evans. .1) Octagonal shape, engraved on both sides. .2) Round shape engraved on both sides. 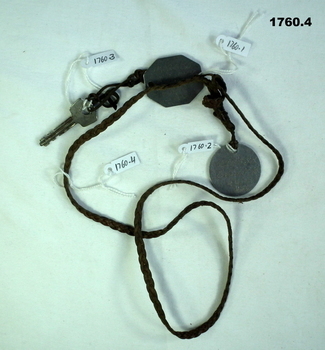 .3) Metal Key, miscellaneous tied to Octagonal disc. .4) Platted leather neck cord to hold ID disc. Victor Henry Evans No 418655 enlisted in the RAAF on 29.5.42. On discharged from the RAAF on 24.8.45 he was a flying Officer in No 1 Sqd RAAF. .1) & .2) "418655 Evans V.H RAAF Meth". 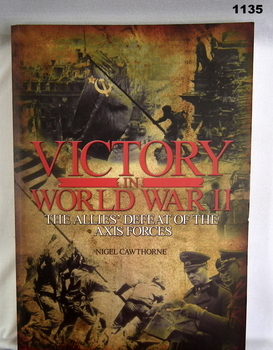 On the obverse "A2"
Book, soft cover, colour illustrated front with title in white. 266 cut edged pages. 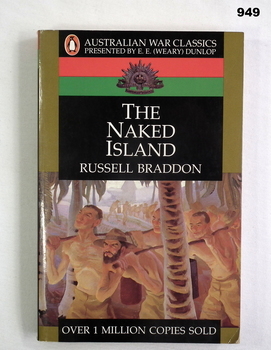 Book is part of the Australian War Classics series presented by E E (Weary) Dunlop. Author documents the suffering of Australian POWs from Pudu, Malaysia to Changi, Singapore based on his personal observations & experiences. 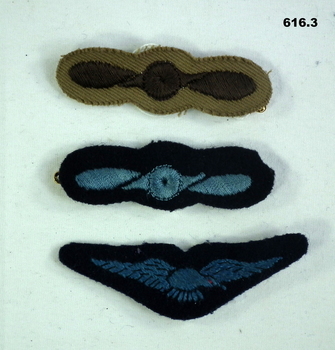 .1) Badge Cloth Khaki Background with Dark Blue Propeller .2) Badge Cloth Khaki Background with Light Blue Propeller .3) Badge Cloth Dark Blue Background with Light Blue Winged Bird. 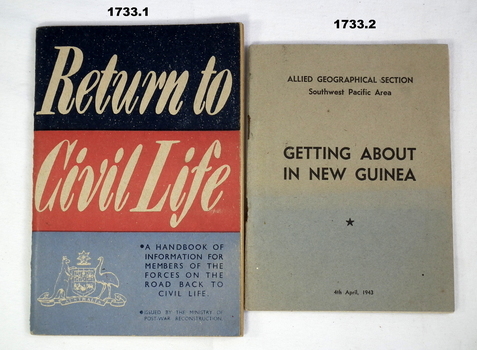 Items issued to either R.G Bennetts No’s 119452, 36088 RAAF, R.R Bennetts No A312177 RAAF. 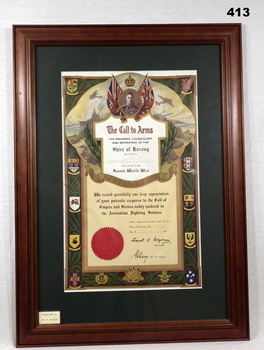 Wooden frame, glass front, cardboard backing, dark green boarder around coloured certificate. Lawrence Francis John HAYES No VX37555 enlisted in the 2nd AIF on 23.7.1940. At discharge from the AIF on 23.10.1945 he was a Pte in 9th Australian Div Cav Regt. Appreciation Certificate, The Call to Arms, from Shire of Korong to Lawrence F J Hayes. Signed by Shire President & Shire Secretary. On rear: Bethany Gallery, 116 Bridge St, Bgo. Tobruk panorama. Black plastic frame, glass front, white cardboard backing, black & white photograph with cream border. Photo in 5 sections showing Tobruk township & surrounding landscape of desert & military vehicles. Pocket size New Testament. Black cover with red & gold edges to pages, & black tape marker. 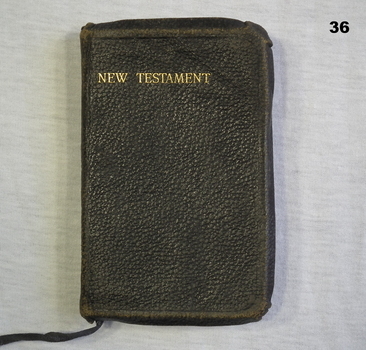 The bible was carried by William James BLAKE No 3110. Enlisted in the 8th reinforcements 60th Batt AIF on 25.9.1916. Embarked for England 16.12.1916. Transferred to the 46th Batt 29.6.1917. Promoted to L/Cpl 6.10.1917. Hospitalised 16.5.1918 with Dysentery. KIA 18.9.1918. 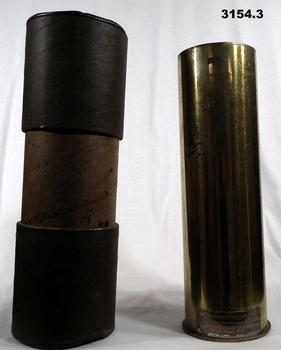 .1) Brass Cannon Shell rimmed. .2) Cardboard tube with end caps to hold shell. .3) Card, RAA Badge. This is one of the last 50 105 mm cannon shells fired in Sth Vietnam. .1) Base of shell stamped: 105 mm M14 Type 1 Lot ERM-1-43 1943 Place at base: Presentation case number 31 of 50. Fired at Nui Dat Sth Vietnam by A Field Battery on the occasion of the Centenary of the Battery, 1 August 1971 whilst on active service with 12 field Regt RAA. .2) Marked: Container M105A2 UAC 105 mm HOW. .3) Card: This cartridge is number 31 of 50. Presented to Col Comdt E Comb by the Commanding Officer and all Ranks 12 Field Regiment RAA, Sth Vietnam 1971. 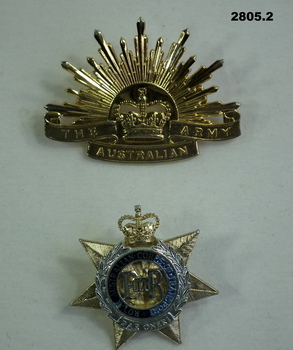 .1) Gold coloured metal Rising Sun hat badge with the words The Australian Army. 2 attached pins & keepers on back. .2) Gold & silver star shaped hat badge with the words Royal Australian Corps of Transport inside a circular laurel wreath. 2 attached pins on back. Charles Jury No 273 enlisted on 17.7.15 in A Coy 29th Batt AIF aged 25 years 11 months. Embarked for Eygpt 10.11.15. Embarked for France 16.6.16. WIA on 19/20.7.16 Shell Wound to neck. Promoted to L/Cpl 2.1.17. Attends Gas School 5.2.17. WIA 2nd occasion 3.3.17 Shell Concussion. Hospital 2.7.18 with Nasal Obstruction. Discharged from the AIF 16.4.18. Refer 2081P also 2080 re his son. "273 L-Cpl C Jury 29 Bn AIF"
.1 Return to Civil Life. Navy blue, red and blue-grey cover with Australian coat of arms in bottom left corner. .2 Getting About in New Guinea. 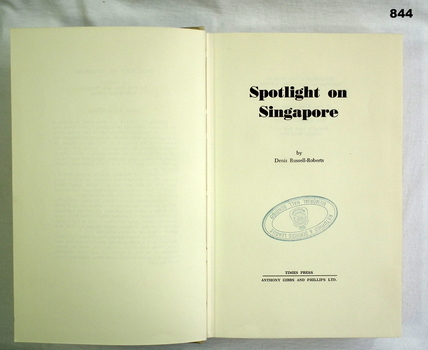 Blue-grey cover with top half faded to grey. .3 Army Rehabilitation. Grey-green cover. .1) Pocket knife, fold out with 6 tools. Sides are wood or wood patterned. 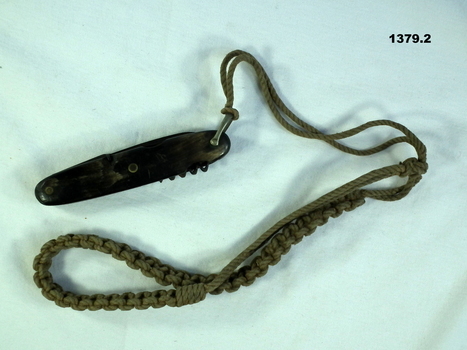 .2) Woven cloth lanyard attached to knife. Item belonged to Edwin James Jones No 3511 AIF. Refer 1367.5 for his service history. 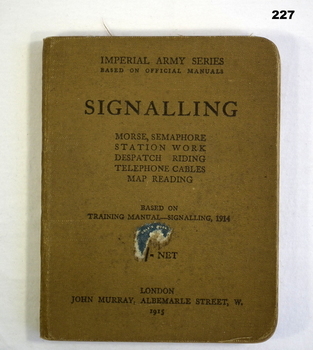 Training manual for signalling methods. 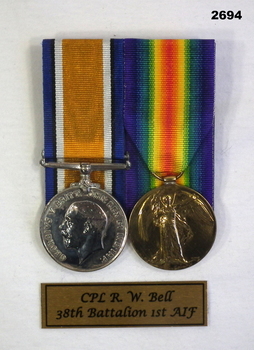 Robert William Bell No 2864 enlisted in 7th reinforcements 59th Batt AIF on 15.9.1916 age 38 years 4 months. Embarked for England 3.11.1916 and promoted to L/Cpl, hospital 6.2.1917 with Bronchitis, embarked for France 25.8.1917, transferred to 38th Batt 2.9.1917 and allotted No 2864A, WIA 4.10.1917 SW left ankle severe, amputated, return to Australia 24.1.1918 for discharge, discharged from the AIF 10.9.1918.